← Why Eat Vegetables? Why Eat Organic? Why Eat Fast Food? Why Eat Raw Food? Santa Claus is coming to Town! 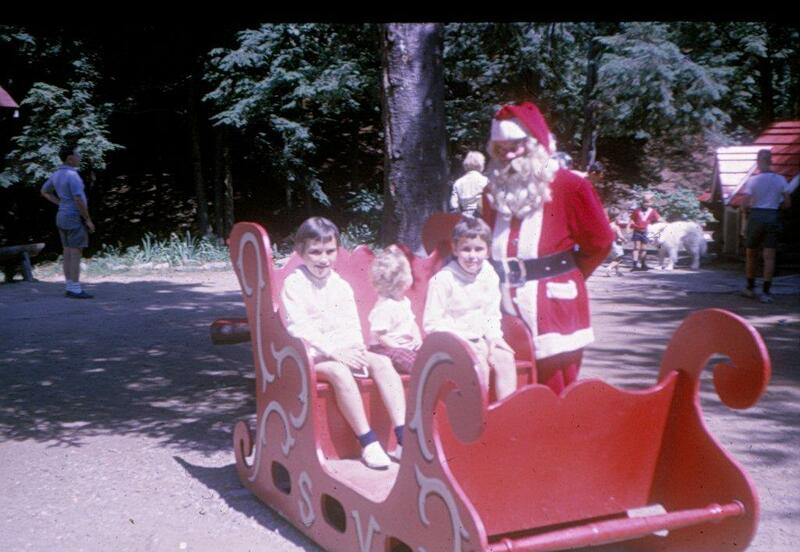 Some of my fondest childhood Christmas memories actually began in the month of November. I remember anticipating many things. My birthday for one. Living in rural South-Central Ontario, the best thing ever, that came to the mailbox was the Simpson-Sears Christmas Wish Book, which was worn out well before the end of November. My sisters and I were allowed to ask for three things, in hopes of receiving one from Santa. I, having my birthday mid-November would prepare my list well in advance. I learned early how to hedge my bets. I would cleverly ask for one special gift off of my Christmas list for my birthday, knowing I would be able to ask for another special gift a month later, and thereby getting two of my three wishes. The next great thing was knowing the annual Toronto Santa Claus Parade would be on TV every year exactly at my birthday time as well. We kids would huddle around the set, drinking hot chocolate, munching cookies, watching the amazing parade floats and those clowns who walked on their hands all the way down the street! At the end I would be waving madly and shouting at the TV when Santa went by, hoping he could see me, secretly acknowledging he would come to my house, knowing I was being the best I could be, in hopes for that special gift. While we were occupied watching the parade every year, my mom would be in the kitchen creating her wonderful Christmas Cake. I suppose it was a time where us girls would be out of her hair for a bit and she could get things done… looking back. In my house, Christmas cake had to be made early so it could age. It was so full of wonderful fruit and nuts and more than likely a bit of rum. Traditional Christmas cake can be made at least two months ahead of time to mature and be fed with brandy at regular intervals. If you forget and make it at the last minute it will still taste great. Alternatively, if you have time, you can also soak the dried mixed fruits the night before in a little extra brandy and proceed with the recipe next day. Creates an even more moist cake. As you begin this holiday season, consider organic flours and sugar for your Christmas baking needs. Organic flours are excellent for making light crisp Ice Box cookies, Gingerbread Men and shortbread. All of my Christmas baking is done with the medium grind White Spelt Flour as I try to be as wheat-free as possible. Homemade stuffing, I make from stale Spelt bread ends that I save up just for that purpose, and what Christmas dinner is not complete with fresh homemade dinner rolls. Here is my prize-winning recipe for my favourite Christmas Cake. I won a free cookbook, Best Recipes Under the Sun from the food editor for the Toronto Sun, Marion Kane, back in the day when I entered my Christmas cake in a contest to the Dini Petty show on City TV. A really cute idea is to put the batter in small muffin tins and bake some Two-Bite Christmas Cakes. Just enough to go with a cup of tea or a glass of nog. If you are spiking your cake, allow the cake to cool completely. Using a bamboo skewer, puncture holes here and there all over the cake, top and bottom. Use a nice rum, spiced rum or my favourite which is napoleon brandy, and pour one ounce over the cake. Wrap in cheese cloth and seal in an air tight container. Store for one to two weeks in the pantry. Remove from cheese cloth, and pour another ounce of alcohol. Re-wrap cake and turn the cake upside down and store for another 1 or 2 weeks if you can wait that long. You really don’t have to wait so long. Cut with a clean sharp knife. Enjoy! In a large bowl, put in carrots and fruits and nuts and mix well. In another bowl, mix flour, baking powder and baking soda. In yet another extremely large bowl, cream butter and sugar together, beat in eggs. Add a 3rd of the flour mixture, the syrup and mix well. Add another 3rd of the flour and the juice, then the last 3rd of flour. Now fold in the carrot mixture and mix thoroughly. Turn into two greased loaf pans or deep circular spring-form pan and smooth the top. Bake at 350 degrees for 1 1/4 hours or until done. Use a bamboo skewer and test for doneness. Allow the cakes to cool in pans for 15 minutes before turning out. Once cool, wrap in a few layers of cheesecloth and wrap well or put in an air tight container. This entry was posted in Uncategorized and tagged Cake, Organic Stone Milled Flours. Bookmark the permalink. 1/2 cup of butter… Thanks for noticing my missing ingredient, it was not intentional by any means.